Wow, this is a simple game. 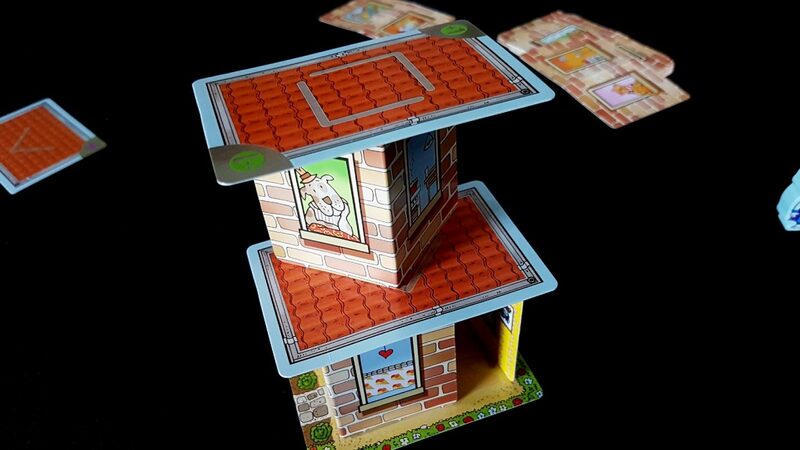 A tiny game. 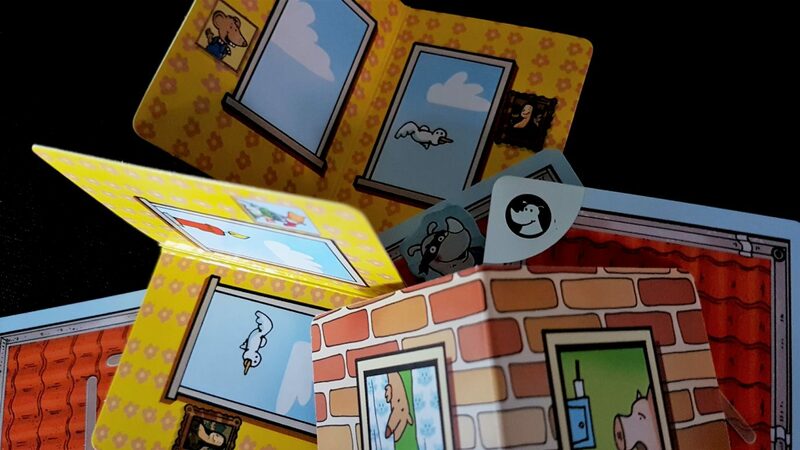 When you open the box, you think to yourself ‘Okay, someone forgot to put the game in here’. 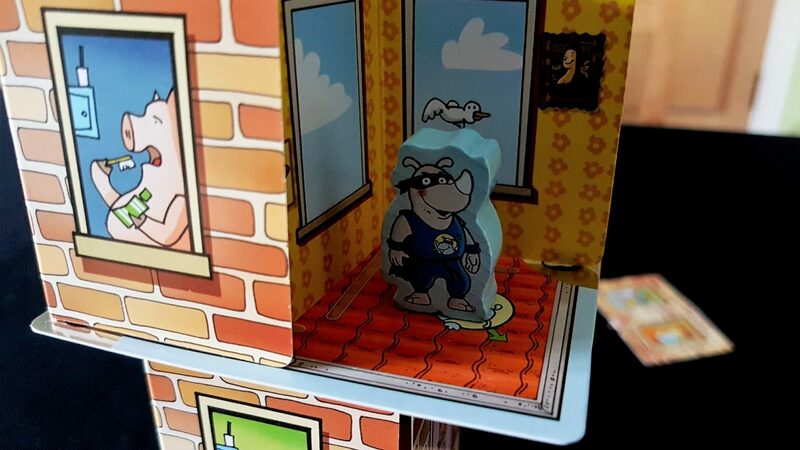 All you get are a few cards and a little rhino figure. That’s your lot. That, as they say, is your whack. It turns out the box contains everything you need. 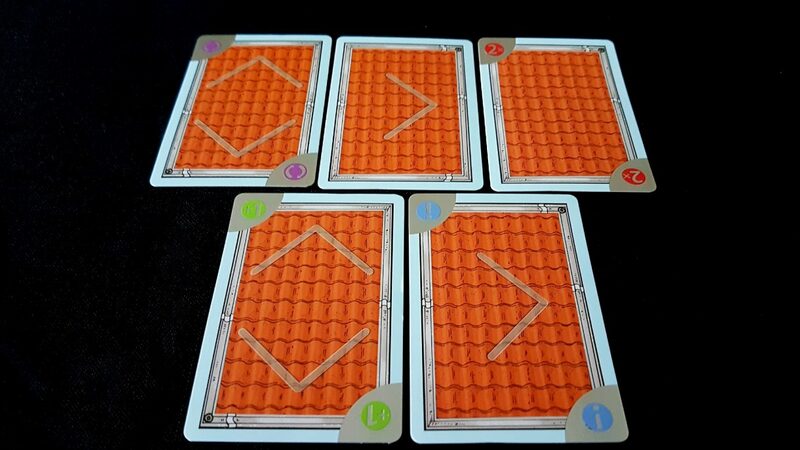 The cards you get are marked with symbols in the corners, and arrows in the middle. You take a glance at the slim rules explanation and suddenly you receive a moment of startling insight as to how the game comes together. Those cards are simultaneously the roof of the tower you’re going to build and passive aggressive challenges for your opponents. 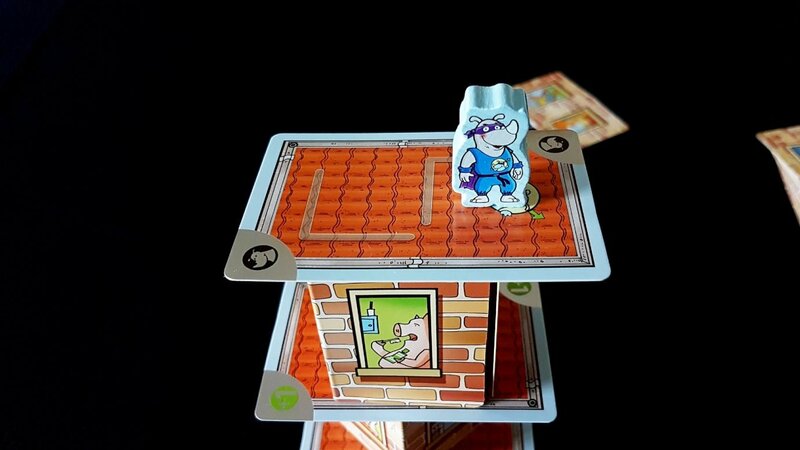 Rhino Hero is a game of reverse Jenga where you attempt to gingerly build up rather than carefully tear down. Don’t kid yourself though, the game still ends in a crash of components. Oh wow. A crash of components. A crash of rhinos. I just got that. There aren’t a lot of different types of cards here but each of them lets you engineer the circumstances under which your opponents labour. 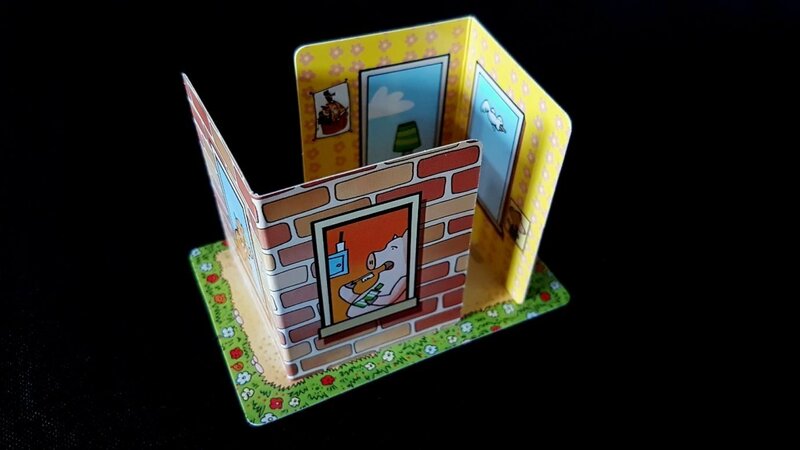 Every card represents a full stop in the drawn out story that is the game of Rhino Hero – it’s where you get a chance to breathe. 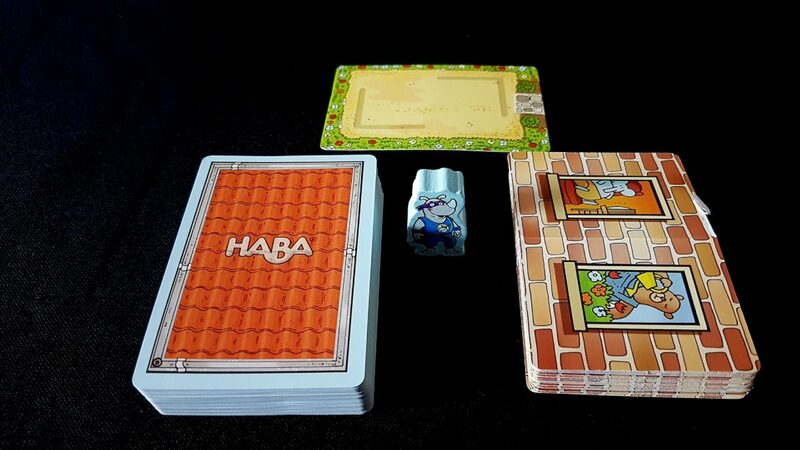 You each get a hand of these dealt out, and the winner is the player that gets rid of their cards first. That 2x card in the top right lets you play two cards in a turn. The +1 card forces an opponent to draw another card into their hand. The exclamation mark makes the next player miss a turn, whereas the cyclic arrows reverse the order of play. It’s the symbols in the middle though that are the real meat and taters of the experience. They show you how the walls need to be placed before you can put a roof down. The special symbols determine progress in the game but the arrows are the guidelines for the job in front of you. Unlike my own foundation, this also isn’t leaking. 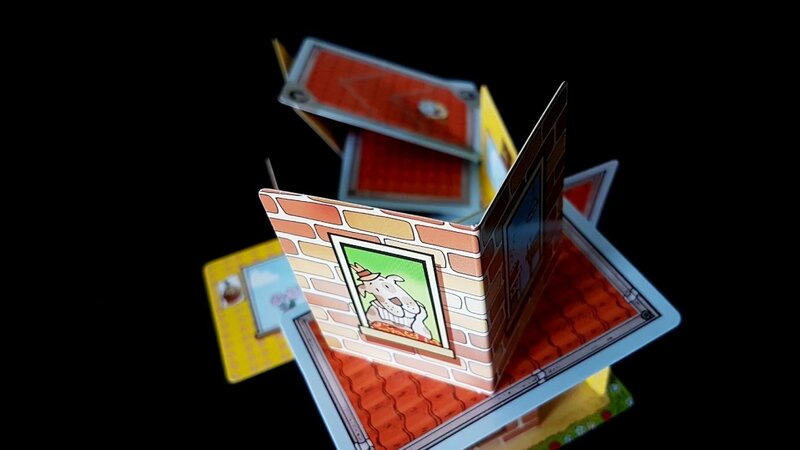 One card is the foundation – the lowest level of the tower. It’s ground zero for the tragedy that the future holds. You’re going to place two cardboard walls in the arrangement shown. 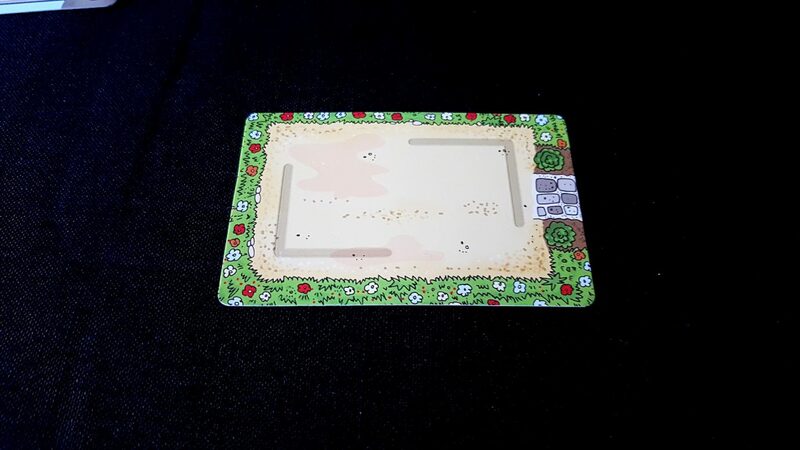 You’re then going to pick a card from your hand, and lay it on the top. You need to be careful though because if you knock over the tower you’ve lost. Don’t knock over the tower. That’s the only rule you really need to remember. As you can imagine, it becomes harder and harder to obey it the greater the number of rounds that have been played. In the last days of the tower every single time the action comes your way it’s like pointing a gun at your head in the hope all you hear is a dull ‘click’. 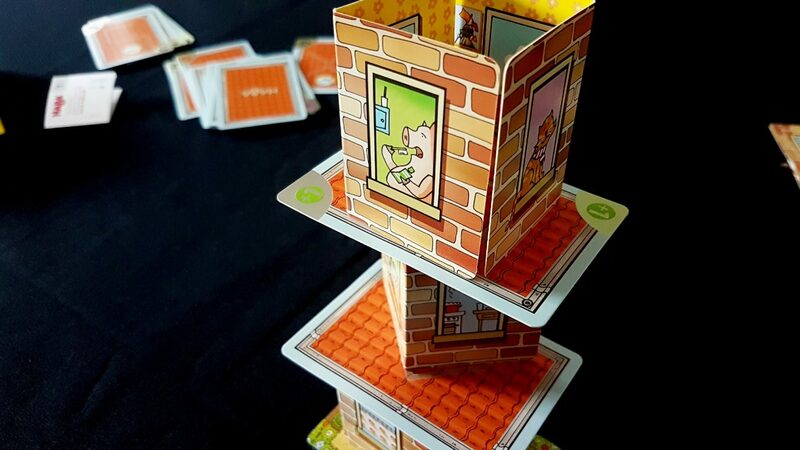 The walls are foldable cardboard and they take on a vaguely ritualistic, totemic aspect when you’re eyeing up the tower. You’ll be folding and flexing them, trying to precisely contour the shape so that it fits ideally for the tower as it lies before you. Every structural flaw left by an opponent is a challenge to your placement – the walls are slightly too large to fit comfortably in the marks left for them. The accumulated misalignments create a puzzle of geometry that has an intensity that trends towards genuinely nerve-wracking. 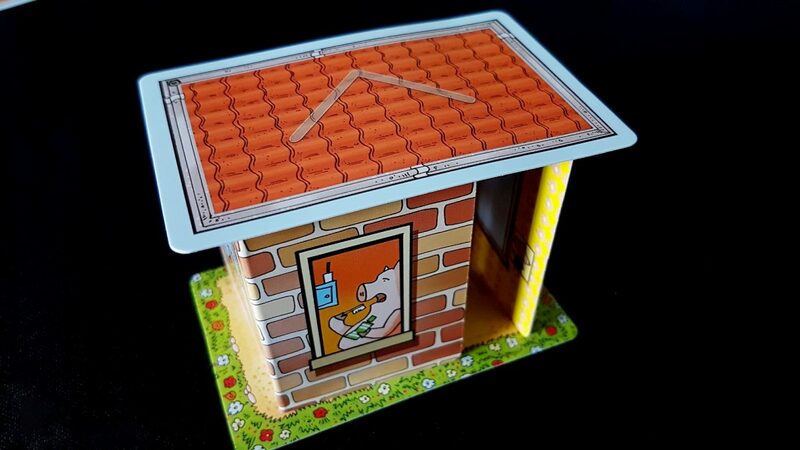 Having placed your walls (hopefully successfully), you pick a roof from your hand and drop it neatly onto the top. If that works, you’ve just handed on a more difficult version of the task to the next player. They’re going to have to contend not only with the card you placed, but the consequences of your shaky, barely functional construction. As the game goes on, the tower sways alarmingly with every slight breeze. You need to sway with it. And then the third player has to look at the mess you’ve both made of the tower. They sigh heavily, and place their own walls, hoping that they’re not going to pay the penalty of your indifferent approach to collaborative architecture. Did I mention I’m afraid of heights? Fun, right? Not yet it isn’t. Oh, you haven’t seen that card before? Sorry, but you should have expected it. 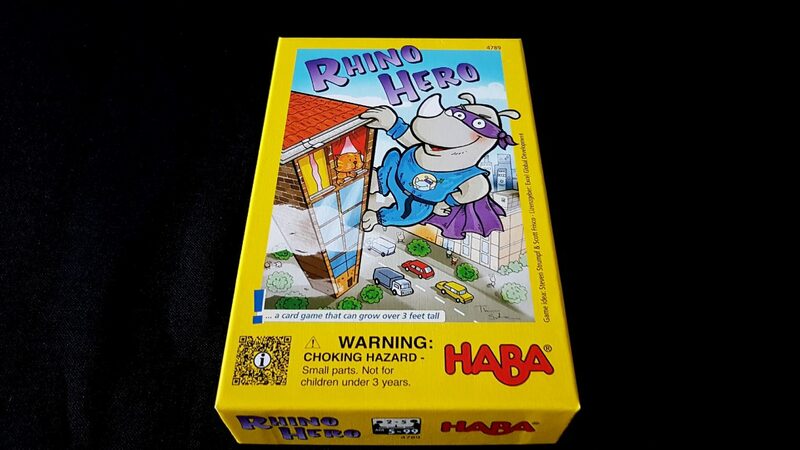 The game is called Rhino Hero after all. 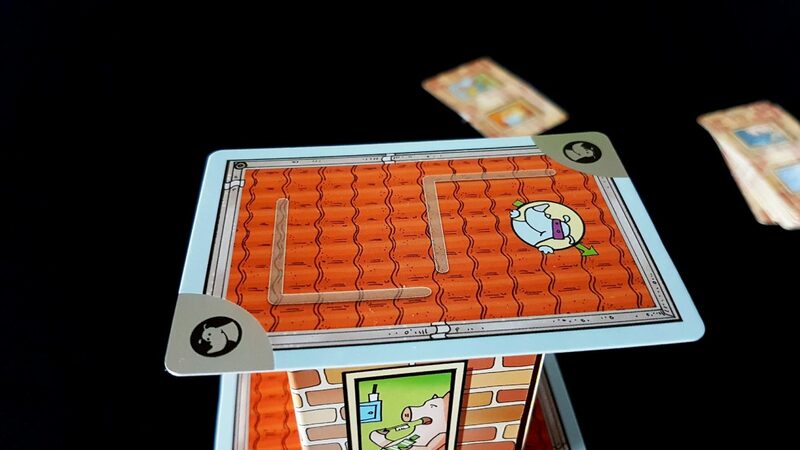 When a roof with this symbol is played, it means the next player has to take the weighty rhino token and place it on the roof before placing the walls. If the rhino has already been placed, they need to fish it out from its existing floor and move it safely up to its new location. All without disturbing the tower as it currently exists. You need to look at the tower in its entirety. And then you need to work out where to place this heavy rhino so that it don’t exacerbate existing issues of placement. It has to go where the mark is, but the exact location you place it matters. Like Indiana Jones slipping a golden idol off of a pressure pad, sometimes even the simple motion of placement or removal is key to success. Remember the sway of the tower. You have to make sure to account for it as you release your grip. You need to become the tower. Don’t breathe. Don’t blink. Don’t even blink. And then once you have placed the rhino, your real job begins. You need to build walls around him, cutting off angles of play that might have been critical to success. Before too much time has passed, everyone is standing. They’re circling the table, eyeing it with all the shrewd professionalism of a championship snooker player. They’re checking sight-lines, working out optimal angles of attack, and meditatively tightening the folds on the walls before they play them. Their tongues poke out as their eyes narrow in contemplation. Every nerve is taut because the distance between winning and losing is vanishingly small. A fraction of a millimetre might decide the fate of the tower in the later rounds. Get the ground wave… detection… dogs? I don’t know how this works.